Radioactive substances dispersed during the 2011 Fukushima nuclear accident caused severe contamination, not only in Fukushima Prefecture but in other parts of the Tohoku and Kanto regions as well. The contamination generated enormous amounts of polluted sludge in the water supply and sewerage systems, as well as highly contaminated refuse incineration ash containing high concentrations of radioactive substances exceeding 8,000 Bq/kg of radioactive cesium in waste disposal facilities. The Law on Special Measures Concerning Contamination by Radioactive Materials defines wastes that exceed 8,000 Bq/kg of radioactive cesium as “designated waste,” and requires the state to dispose of these materials, along with the radioactive waste from the Fukushima evacuation zones. The law stipulates a basic policy of obliging the prefectures where such wastes have accumulated to dispose of them within their territories. The Ministry of the Environment, therefore, selected candidate sites for the disposal facilities and proposed negotiations with the local governments on this issue. The residents of the selected sites, however, reacted sharply against the proposal, launching protests in some parts of the country. Although the Ministry of the Environment chose Yaita, Tochigi Prefecture, and Takahagi, Ibaraki Prefecture, as candidate sites in 2012, its high-handed method of selecting the sites, without making any prior approaches to the local administrations, provoked massive opposition among the local governments and residents. Consequently, the ministry was forced to retract its decisions. At present, the Ministry of the Environment is choosing candidate sites after obtaining endorsement for its selection procedures from the “expert panel on designated waste disposal sites” and proposing the procedures to local mayors. Under the procedure, each candidate site is given marks to ensure objectivity of the selection process. Nevertheless, the conclusion can be changed easily if the ministry makes a policy shift, for example, to give priority to localities with state-owned land. Thus this new selection process does little to reassure local residents. 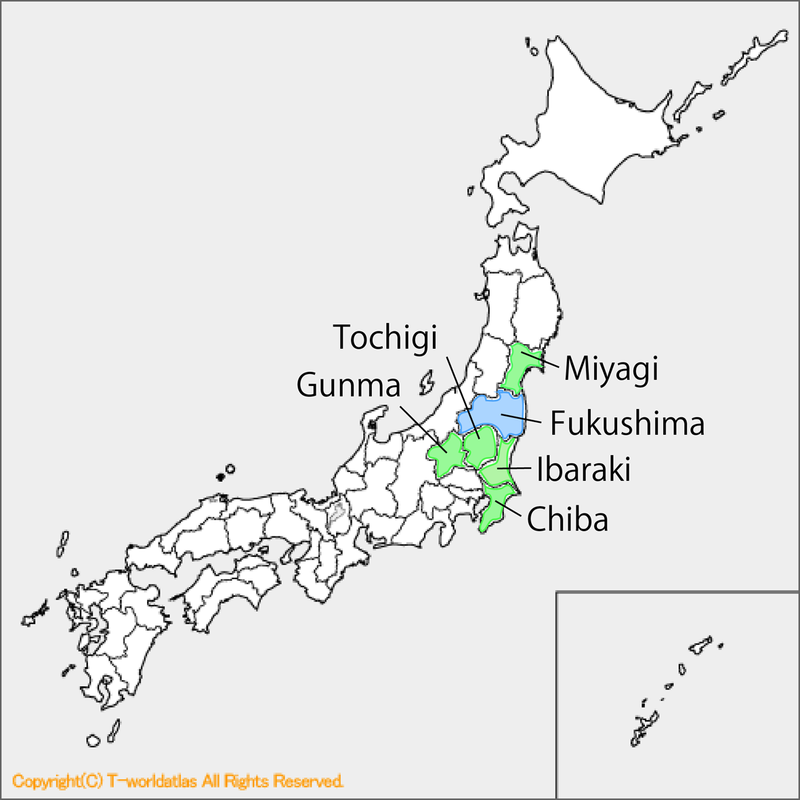 Miyagi In January 2014, three towns were selected as candidate sites, Kurihara, Kami and Taiwa. Residents of Kami Town blocked roads in protest against the state’s dispatch of officials to the town to conduct on-the-spot investigations in October 2014, August 2015 and October 2015. As a result, the investigation has yet to be conducted in the three towns. Tochigi In July 2014, the town of Shioya was selected as a candidate site. The town is known for clear spring water, chosen by the Ministry of the Environment as one of the 100 best-quality spring water sources in Japan. The residents were strongly united against the government’s decision. In September 2015, the candidate site was inundated when torrential rains hit the area, and the access road was severely damaged. Chiba The premises of Tokyo Electric Power Co.’s Chiba thermal power plant became a candidate site. Many residents opposed this decision, citing the facts that the plant is located in a densely populated area and that it is standing on land liable to liquefaction during an earthquake. Ibaraki Local mayors in the prefecture met in January 2015 to confirm their traditional policy of storing contaminated sludge and ashes within their own jurisdictions. Gunma Since July 2013, the local mayors’ conference to discuss selection of candidate sites has yet to be convened to date. The prefectural government is taking a wait-and-see attitude. The Ministry of the Environment no longer uses the term, “nuclear waste disposal sites,” and instead, refers to them as “long-term management facilities.” This symbolizes its ad hoc, erratic policy concerning radioactive-waste disposal. The ministry’s plan says the radioactive waste will be placed in concrete structures, and in the first monitoring period, cracks will be repaired by using inspection tunnels, which will later be filled in with bentonite. However, the first monitoring period for the designated radioactive waste disposal sites is only several tens of years, much shorter than the 300 years for the Rokkasho Low-level Radioactive Waste Disposal Center in Aomori Prefecture. In addition, the designated radioactive waste disposal sites will be surrounded by permeable soil, while the concrete structure at the Rokkasho center is surrounded by bentonitic earth or bedrock. Due to this difference, the ministry says it will construct impermeable walls around a disposal site if contamination of groundwater is confirmed in the observation well. The expert panel has already approved this plan. These proposed measures, however, do not guarantee the safety of the disposal site. The ministry’s plan also calls for construction of an incinerator for inflammable radioactive wastes next to disposal sites, which has increased popular concern over air pollution as well. To establish a radioactive waste disposal site, like the Rokkasho Low-Level Radioactive Waste Burial Center, it is necessary to obtain permission from the Nuclear Regulation Authority. To set up a disposal site for industrial or other ordinary waste, permission from the prefectural governor is necessary. Despite this fact, the Law on Special Measures Concerning Contamination by Radioactive Materials does not have any provisions concerning this rule. For this reason, the Ministry of the Environment is able to establish on its own disposal sites for designated radioactive wastes and interim radioactive waste storage facilities, such as the one now being constructed near the Fukushima nuclear accident site, without obtaining any permission. Moreover, the Environment Minister is authorized to examine, provide guidance, and issue orders to improve such facilities. This gives the impression that the law was legislated for the benefit of the Environment Ministry. Another problem with the law is that it has no provision for regular inspections, although it is mandatory for operators of radioactive waste disposal sites and similar facilities to have such provisions. It is the basic policy of the law that the annual radiation exposure dose to local residents caused by the radioactive waste disposal operations should be held below 1 millisievert. The dose limit is the same as that for ordinary citizens, and the setting of this limit, without taking into account the additional risk for the local residents, is impermissible. Even though I am willing to show respect for the actions to present counterproposals by the Citizen’s Commission on Nuclear Energy2 and others, I believe that we should firmly maintain the stance that it is impossible to dispose of radioactive waste. Provisional storage of radioactive waste is premised on disposal and seems to be inappropriate. Reversibility and retrievability are currently being discussed concerning the disposal of high-level radioactive waste, but once the groundwater is contaminated, it is no easy matter to purify the water, and disposal of radioactive waste with reversibility is not possible even in the future. We must learn a lesson from the fact that the 2011 Fukushima accident has been polluting the environment and that people living in those areas are still enduring great distress. It is said that continuing storage would impose burdens on future generations, but I think priority should be placed on the sense of security we can feel from the fact that the contaminated waste remains under control. Quite a large number of people would probably side with me and support this fundamental principle. If so, confusion in various parts of this country will not be settled as long as the Environment Ministry sticks to the disposal policy. In Ibaraki Prefecture, as shown in the table on the previous page, the dispersal storage policy is being taken because the local mayors have refused to follow the Environment Ministry’s disposal policy. The ministry, however, says this dispersal storage policy cannot be adopted in the same way in Miyagi and Tochigi Prefectures. This is because there are large amounts of radioactive waste from public facilities in Ibaraki Prefecture, such as sludge from the water supply and sewerage systems, while there is a great amount of contaminated agricultural waste, such as rice straw and manure, that is being kept on local residents’ private property in Miyagi and Tochigi Prefectures. In fact, as many as 439 bags containing radioactive waste were swept away when torrential rains hit Iitate Village, Fukushima Prefecture in September, and some of them became unrecoverable. Similar incidents must not happen again. How about a plan to build robust storage facilities on the premises of local government offices and electric companies’ property in order to store such waste there? Even if we say we should store the radioactive waste, there will be a problem of where it should go in the next stage. It is not easy to come up with a policy that ensures fairness among the local communities concerned and form a consensus among them through democratic procedures. As for the problem of the designated radioactive waste, not only selection of candidate sites but also the disposal policy itself should be widely discussed. It may serve as a test for resolving the problem of disposal sites for high-level radioactive waste, as the government is also adopting the same policy of receiving offers from local governments in selecting these candidate sites. 1) Kazuhide Sueda is a member of the Radioactive Waste Campaign Kansai. He maintains a website called “The Story about the Environment and Nuclear Power” in Japanese.